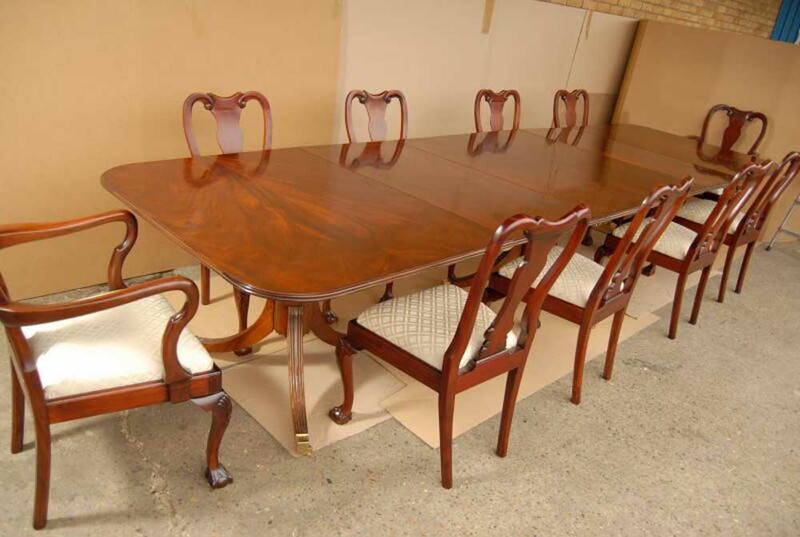 You are viewing the ultimate dining set in the shape of ten mahogany Queen Anne dining chairs and a matching Regency style pedestal dining table that measures ten feet long. I hope the photos do this stunning outfit some justice, it is certainly more impressive in the flesh and would make for a great addition to any home interiors scheme, it really is the ultimate in luxury dining. Eating together, whether with family or friends is perhaps one of the most important things we can do – why not do it in uttermost style? Plus, in flaky economic times such as these why not invest in something that will retain it’s value and become a great family heirloom as this will last for generations? 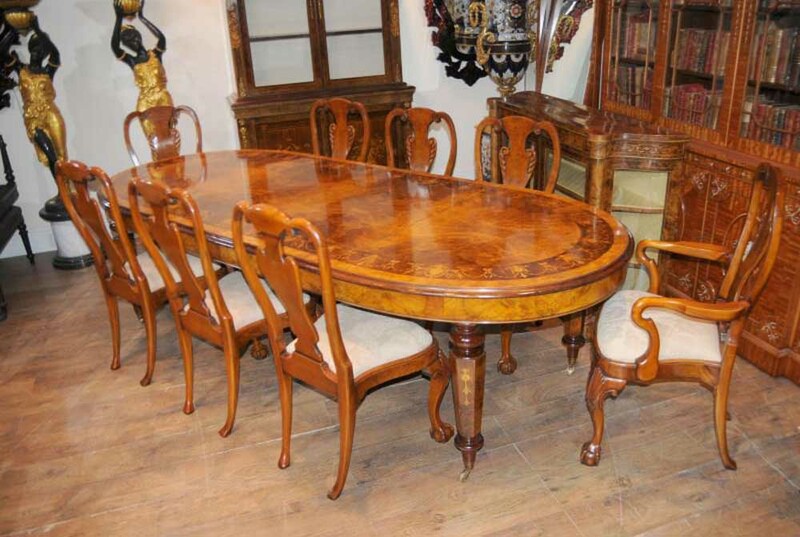 The table is great as it can be extended or made smaller to suit your purposes. Fully extended at ten feet it’s a large table suitable for grand dinner parties, as you can see in the pictures it sits ten people more than comfortably. It’s easy to make smaller by taking out the two leaves (which each measure 22 inches) to make various different size combinations. You can even just have the two pedestal ends together for the smallest option. 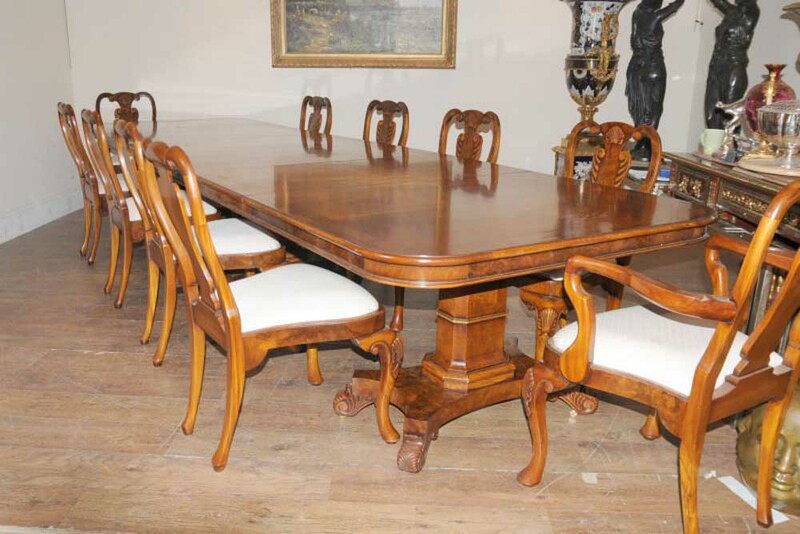 The table is on pedestal legs which in turn are on castors so it is easy to move around. 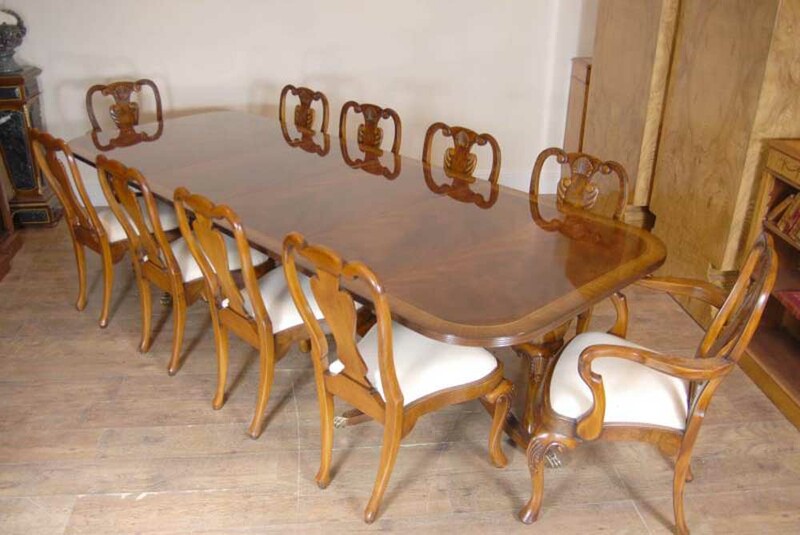 The table is in mahogany with a walnut crossbanding to the perimeter. 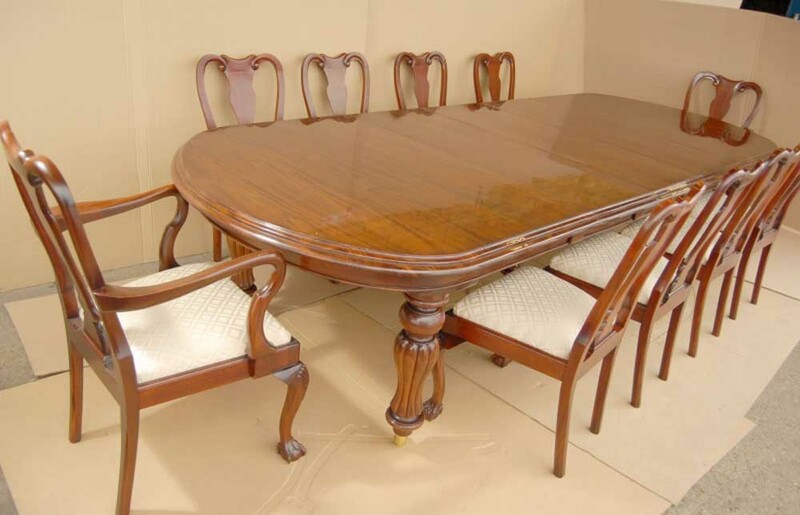 The table is solid and sturdy, ready for home use right away with no scratches or other surface damage. 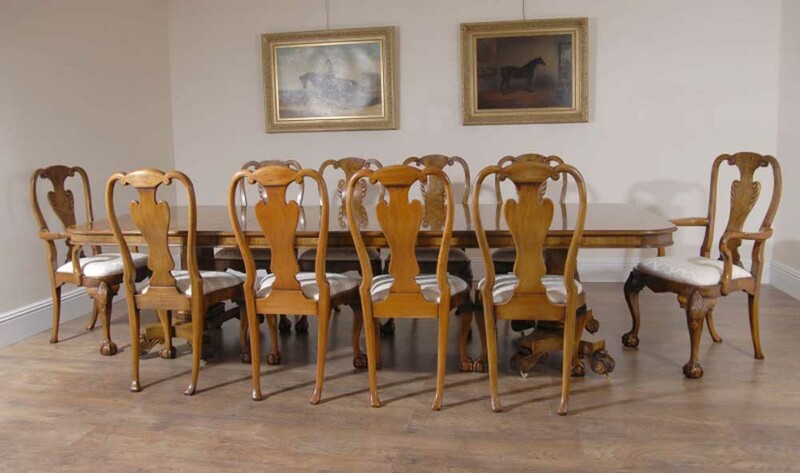 What can be said about the Queen Anne style dining chairs in mahogany? 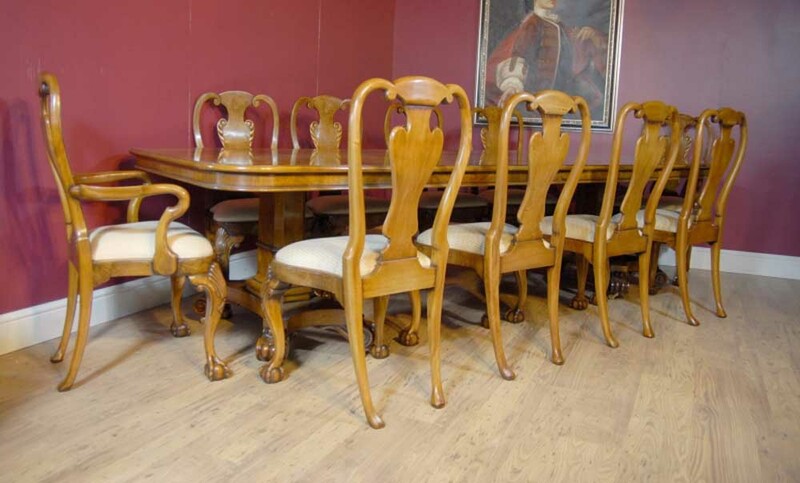 I hope the photos do this sumptuous set some justice, these are the Queen of dining chairs – fit for a King! The Queen Ann dining chair is a design classic favourite through the centuries for the mix of comfort (with the high backs) and elegance. They\’re a solid chunky chair and very comfortable to sit into. 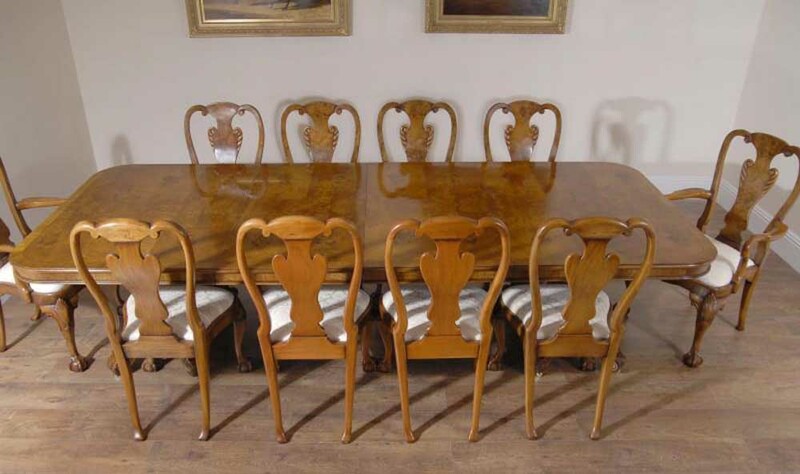 This set consists of 8 side chairs and 2 arm chairs.